Molly is resourceful and used to being a bit different, but how will she cope when a small mistake turns her mother into a tree? Her herbalist mother is still in the front garden, nurturing, but very definitely a tree and the neighbours are hostile. A wonderful tale about friendship that brings whimsy and enchantment into everyday life. Perfect for ages 8–11. This spellbinding graphic novel is both beautiful and heartbreaking. It is the story of a musical child prodigy, Kid, who is exploited by his mentor but discovers freedom when he meets petty thief, Shoestring. Kid’s epic hero’s journey from naivety to knowledge of his past, appreciation of his talent and, ultimately, awareness of his power, is breathtaking. KidGlovz is a brilliantly imaginative story that resonates and is suitable for readers aged 10 through to adult. Quinn and his adventurers are back in the sequel to the brilliant Race to the End of the World. Continuing on their quest to navigate and map the unknown lands and seas of their world, the crew of The Libertas once again find themselves embroiled in mystery, betrayal, kidnappings and skulduggery. Ideal for fans of Deltora Quest and Percy Jackson aged 9 and up. ‘P’ is for Perry, a funny and enchanting girl who is making a rather eccentric alphabet book about the residents in her gran’s nursing home. ‘B’ is for bewitching, which is what this book is and it gets better with every reading. It is a gem of a story that explores old age with a charming dignity and the quirky illustrations heighten the offbeat joie de vivre that will stay with you long after you close the book. For ages 5–100. Navigating the journey from childhood to young adulthood is never easy, even for those blessed with loving relationships. 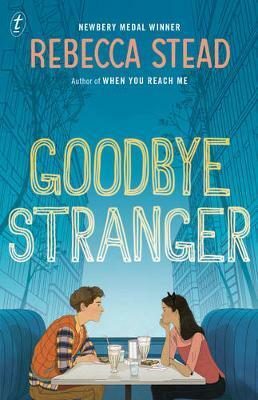 Goodbye Stranger is a warm and tender story of 3 steadfast friends as they transition from the relative safety of primary school to the challenges of Year 7 and high school. This is a wonderful story, beautifully and realistically imagined but with a deft touch full of empathy and humour. I loved it! Highly recommended for ages 11 and up. Dark and quirky but entirely entertaining, Stonebird tells the story of Liam, who moves house to be closer to his sick grandma and meets a gargoyle who changes his life. A powerful tale about the magic of stories, this is a great read that discusses the connection between generations without underplaying the stresses of dementia. Revell manages to both enthral and enrapture without shying away from the topic at hand. Angus and his little sister Martha have just moved to a new neighbourhood and are dreading a boring summer with nothing to do. But when a mysterious shop opens next door, full of exciting and strange items, their lives take a very different turn. An exciting adventure story (with just a hint of creepiness) that mixes classic Australian scenery with Norse mythology. Great for boys and girls 9 and up. The death of Suzy’s best friend in a drowning accident sees Suzy become mute, in denial about the death and unable to openly express her grief. This touching story left me impressed at how well the subject of friendship and grief was tackled for the middle fiction audience. Perfect for ages 11 and up. When Maggie is gifted a beautiful diary for her birthday she decides to write the story of the past year when her dad had to leave his job due to illness. What ensues is a touching, extremely hilarious ‘autobiography’ of sorts by a very intelligent 11 year old. A highly recommended read for ages 11 and up. Take three best friends, the summer holidays and a semi-criminal mastermind plan to make reading an all-time classic novel cool again and you’ve got I Kill the Mockingbird – one of the most joyous adventures I’ve read all year. Tender and funny and with ‘a little pinch’ of kids asking themselves important life questions, it celebrates friendship, reading and the power of books.